Golden State 121, LA Clippers 103. 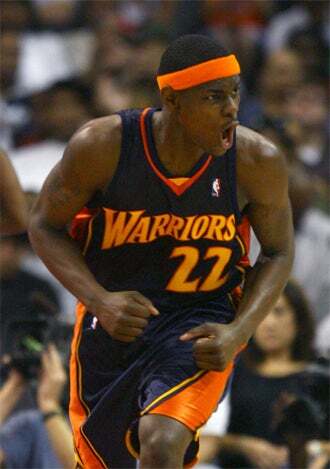 Get ready to hear the name Anthony Morrow a lot this winter. The undrafted rookie out of Georgia Tech scored 37 points in his first career start. Typically playing as a reserve this season, Morrow shot 15-of-20 in his 42 minutes on the floor last night. "Sometimes I don't shoot 15-of-20 in drills," Morrow said. Boston 102, Milwaukee 97, OT. Andrew Bogut and Kevin Garnett got into a scuffle under the hoop at one point, earning each player a technical foul, and Bogut was ejected from the game. It was Bogut's second T of the night. Or the officiating crew had money on the Celtics. One of those. He left the game with 20 points, which led the Bucks. Cleveland 105, Utah 93. LeBron finished with 38 points, including 16 in the 4th quarter. Former Cav Carlos Boozer led Utah with 17 points, which isn't a lot, but that's probably why they lost. New Jersey 119, Atlanta 107. Devan Harris and Vince Carter scored 33 and 29 points, respectively, to sweep Atlanta in their home-and-home series. Shouldn't it be "home-and-away" series? How is it home and home when one game is played on the road? Am I giving this too much thought? Okay, then. Philadelphia 110, Oklahoma City 85. The Thunder drop to 1-9 on the year, a record nearly as paltry as their logo. Other scores: Portland 88, Minnesota 83. Houston 91, New Orleans 82. Chicago 104, Indiana 91.